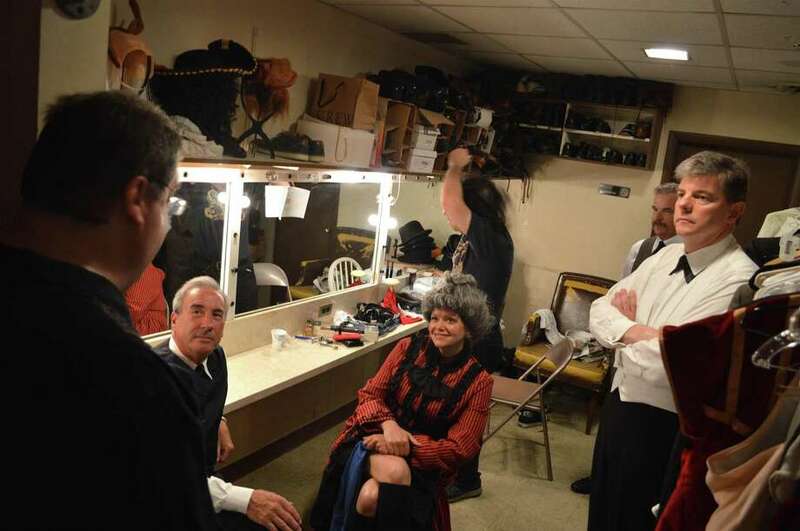 NEW CANAAN — There may actually be even more going on behind the curtain at The New Canaan Town Players’ latest production at the Powerhouse Theater, than what’s in front of it. “Baskerville: A Sherlock Holmes Mystery,” being performed by the local ensemble through Aug. 11, features a multitude of super-fast wardrobe and wig changes, but for only five actors, requiring four dedicated dressers to help them with 60 different costumes. “It’s been quite an experience,” said Marcia Vinci, producer and NCTP co-president. “It’s probably one of the most technically involved shows the Town Players have ever done,” with around 200 different light and sound cues to contend with as well. The comedy piece, written by Ken Ludwig and directed here by Joel Fenster, involves Arthur Conan Doyle’s famous detective and his ever-present partner Dr. Watson.